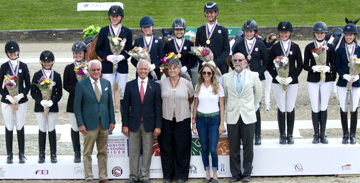 The North American Junior Young Rider Championships (NAJYRC) is a unique and prestigious competition which brings together the top Federation Equestre Internationale (FEI) Junior and Young Riders, age 14-21, from throughout North American and neighboring countries. Teams of qualified riders vie for team and individual FEI medals in the three Olympic equestrian disciplines of show jumping, dressage, and eventing, the Para-Olympic discipline of para-dressage, and the FEI World Equestrian Games disciplines of reining and endurance. NAJYRC is subject to the rules and restrictions of the FEI and is designated as a Continental Championship. It is the only FEI championship held annually on this continent. their successes in New York! Congratulations! 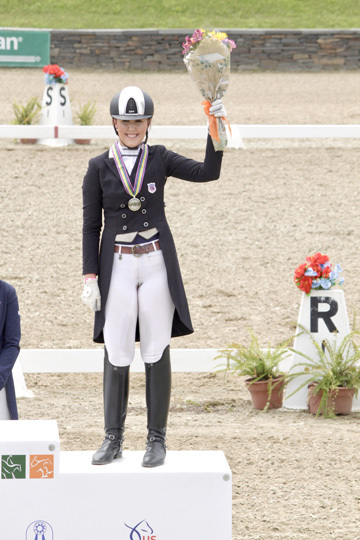 Young Rider REGION 4-5-7 places third and receives the Team Bronze Medal at 2016 North American Junior and Young Rider Championships! We would like to thank our sponsors, Western Saddlery, Shockemohle, Untuck It, California Dressage Society, California Riding Magazine, W Farms and the many others who have supported us! Congratulations Team Region 4-5-7!! Kate Cassidy (7), Codi Harrison (4) and Lexy Donaldson (5), enjoy your Bronze Medal!! !